clasp magnetic rhinstine clasp in silver. This is a really unique way to showcase seashells. The grey rondelles are a pretty contrast to the white shells. 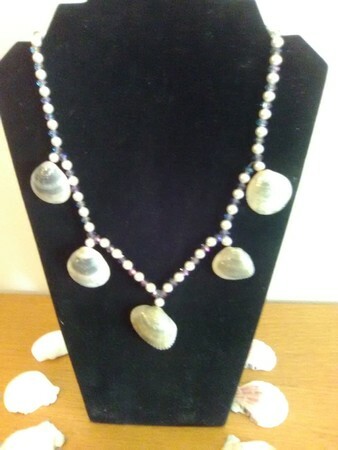 I love the seashells and their arrangement on the necklace! Very pretty design. Pretty, beachy necklace! And a fun way to showcase your seashells. I have some that I collected on Sanibel but haven’t used yet. This is a nice idea. Ready for summer, ready for the beach! Love the shells with the Swarovski!